My head and heart are a muddled mess this morning, like the knot of beads and silver chains on my dresser. Some thoughts from my journal…. Leading worship at our Women’s Retreat this weekend–do I know the songs?When am I going to practice? Preparing and praying for my little workshop on Writing as a Spiritual Practice. Not sure what the women will think, but confident God will show up. Man! I need to go buy bubbles for doorprizes for our ice breaker. Must upload pictures for slideshow for icebreaker. 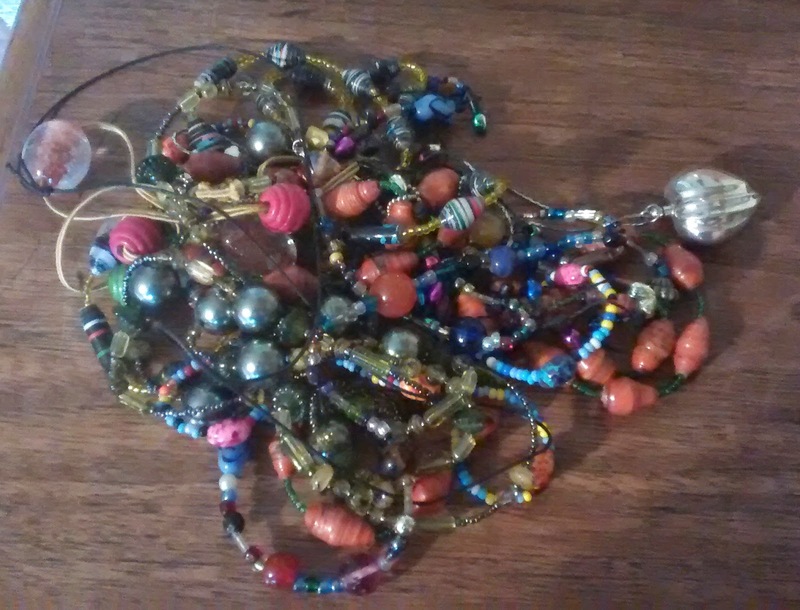 As I ponder the pile of necklaces that need unraveling, Holy Spirit reminds me of the words from this song, one we’ll be singing over the three days–Jesus is at the center of it all. Underneath the tangled clump of beauty, Jesus is the One who holds it all together and HE will help me unravel the strands. Love your statement of faith, Jody: “HE will help me unravel the strands.” In tandem with that lovely-but-jumbled bunch of necklaces, you've created a highly meaningful metaphor! Numerous times I have faced the same tangle of too much to do and not enough time to do it. (I wasn't as trusting as you, however. Although I prayed for God's help, more often than not stress was still my companion!) But frequently God surprised me by removing several tasks, streamlining a few, providing others to handle one or two, etc. Perhaps you can follow-up with a “Look What God Did” post for next week! Love and prayers, Jody, for a highly blessed retreat.